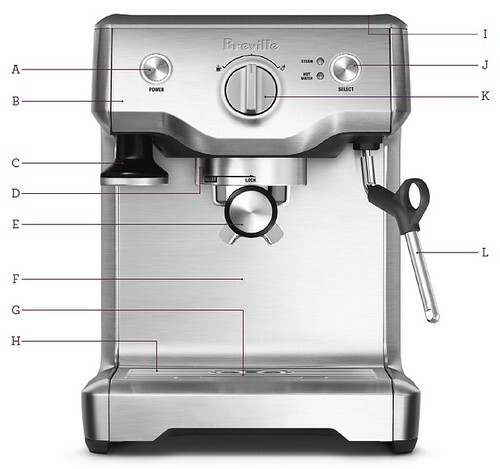 The Breville® BES810BSS Duo-Temp™ Pro – How do you go from steam to espresso without burning the next coffee? The Duo-Temp Pro automatically cools the heating system by purging the excess steam for optimal coffee extraction. The low pressure pre-infusion technology with precise PID temperature control produces a balanced extraction for the perfect espresso every time. This commercially inspired design will make a statement in any kitchen. A. POWER Button. B. Thermocoil Heating System. C. Integrated Removable Tamper. D. Group Head. E. 54mm Stainless Steel Portafilter. F. Extra-Tall Cup Height. G. Drip Tray Full Indicator. H. Removable Drip Tray. I. Cup Warming Tray. J. SELECT Button. K. Control Dial. 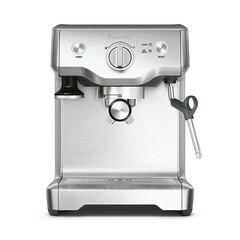 L. Swivel Steam Wand. Water Tank. - 1.8L Removable Water Tank. Storage Tray. - Tucked Behind the Drip Tray. Trimming Tool. - The 54mm Razor™ Precision Dose Trimming Tool. Single Wall Filters. - Single Shot and Double Shot 54mm filter baskets. Dual Wall Filters. - Single Shot and Double Shot Dual Wall Filters. Water Filter. - In-Tank Water Filter. Frothing Jug. - Stainless Steel Milk Jug. Cleaning Tool. - Cleaning Tool Designed for use on both the Filter Baskets and the Steam Wand. Cleaning Disk. - 54mm Silicone Cleaning Disc for the Brew Head. Cleaning Tablets. - For use when Running a Cleaning Cycle.